I’m very proud to introduce you to our first guest! I’ve found this little phrase on her site: “Most of the crocheting and knitting I do is for charity.” How awesome is that! I won’t take any more of your time, please welcome Julie! Hello friends and readers of Sarah’s Kitchen. I am Julie from Julie’s Lifestyle and I’m happy and excited to be here today to guest blog for Sarah. I love cooking and sharing simple and easy recipes for my family. This is a delicious recipe for Baked Chicken that I would love to share with you today. Dinner can be ready in minutes with this healthy recipe. Preheat oven to 375 degrees. Using any Italian Dressing that you like, marinate chicken for a few hours. Put bread crumbs in a large dish and add cheese, salt, pepper, and mix it all up. Take chicken cutlets and coat with bread crumb mixture. 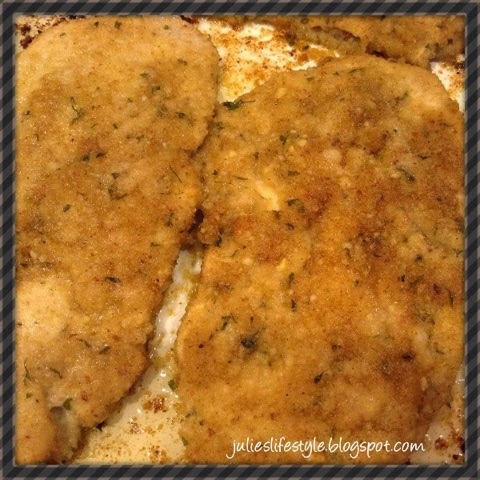 Add olive oil to coat a large baking pan and add breaded cutlets. Bake in oven at 375 degrees on one side for 15 minutes and then turn over and bake for another 10 to 15 minutes. Looking for another Chicken Recipe? Why not try my Chicken with Mushroom Recipe! Thanks Sarah for this opportunity to guest blog for you today and share my recipe with your readers. If you would like to visit me over at Julie’s Lifestyle you can see more of my recipes. I hope you all enjoyed Julie’s recipe! what a great post and what a delicious baked chicken! Chicken is so delicious I feel like you can’t go wrong! Looks like a good recipe, thanks for sharing! Hi Sarah, thank you for sharing Julie’s recipe in your guest post. So nice to meet you. I have followed Julie for awhile and she is so talented and such a sweet blog friend. Love this Julie. Sounds so good and easy to fix. Thank you for sharing and congrats on your guest feature here. Great to see you here to visit Julie’s post 🙂 She really is such a sweet and talented person! These look really good, it reminds me of one of my favorite meals from childhood! Comfort food! Oh that looks so delicious! And I’m always looking for new chicken recipes and Julie has them, thank you for sharing here. Also get to visit Sarah’s blog as well. Cheers! Her Chicken really looks great! 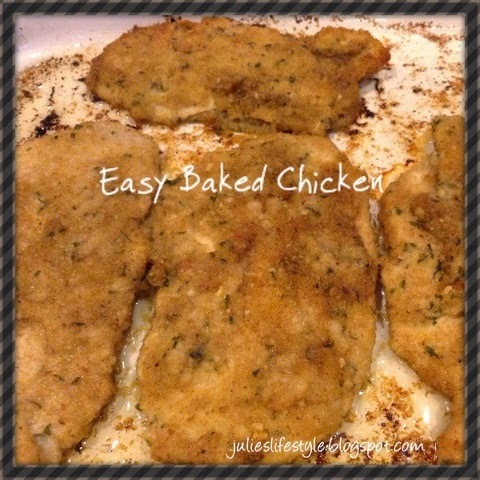 I came to visit Julie over here today and found a new blog to frequent, as well as enjoy Julie’s beautiful presentation for her Baked Chicken! It does, right! Julie did a great job! A great, simple, quick recipe for a weeknight. I wanted to add Julie to my Reader’s feed, as I’m very interested in knitting and crochet too, but for some reason, I couldn’t find a “follow” button on my Reader. It usually appears on the top left, and I just click on it to follow. Welcome Julie. Thanks to Sarah as well as Julie for sharing it with all of us.